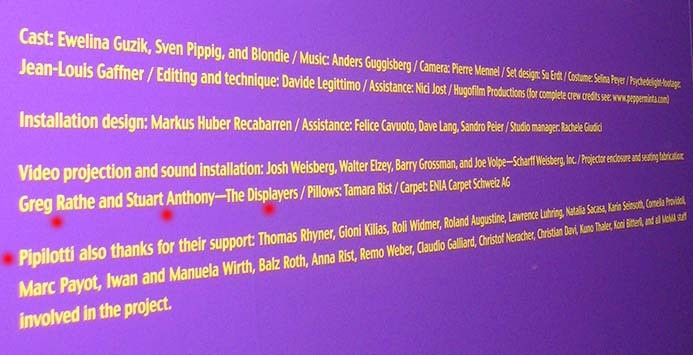 The Displayers are very proud to have taken part in this project and grateful to Pipilotti Rist and The Museum of Moderm Art (MOMA) for publicly thanking The Displayers upon the exhibitions plaque. 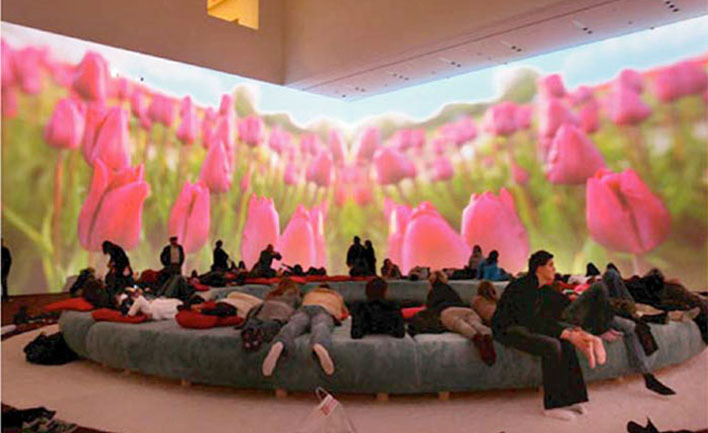 Pipilotti Rist’s video installation projected upon all walls of the MOMA’s second floor large gallery. Conceived for the public to view the installation from the prospective of artist, the floor was covered with carpeting and a 40′ diameter round couch that from above (and the third floor) looked like the iris of an eye. Upon the walls were (3) organic shaped round enclosures 15′ round designed to house and conceal theater scaled projectors and blend into the video. These enclosures were created from foam, custom carved and engineered to address ventilation, access and mounting of the projectors. The Displayers created these enclosures and couch for this exhibition. An article about our beginning. THE FAMILY BUSINESS CAN BE a frustrating place for a budding entrepreneur. Eager to make his own way, Greg Rathe abdicated his position as third-generation heir apparent at Rathe Productions, a big designer of trade shows and museum exhibits. Instead, four years ago he founded his own outfit, The Displayers. “Growing your own company is something you don’t get a chance to do in a 55-year old family business,” says Mr. Rathe. Naming his company after his grandfather’s biggest competitor in the 1950s. Mr. Rathe targeted an eclectic array of businesses, designing and installing trade show booths, exhibitions and showrooms. Mr. Rathe says he made a specialty of fast turnarounds, calling on relationships he’d built up with suppliers during his years at the family business and assembling a melting pot of specializations on his staff. The company balances display design with corporate identity work. Projects include in-store marketing materials for Apple Computer stores and acrylic logos for DKNY stores in Europe. 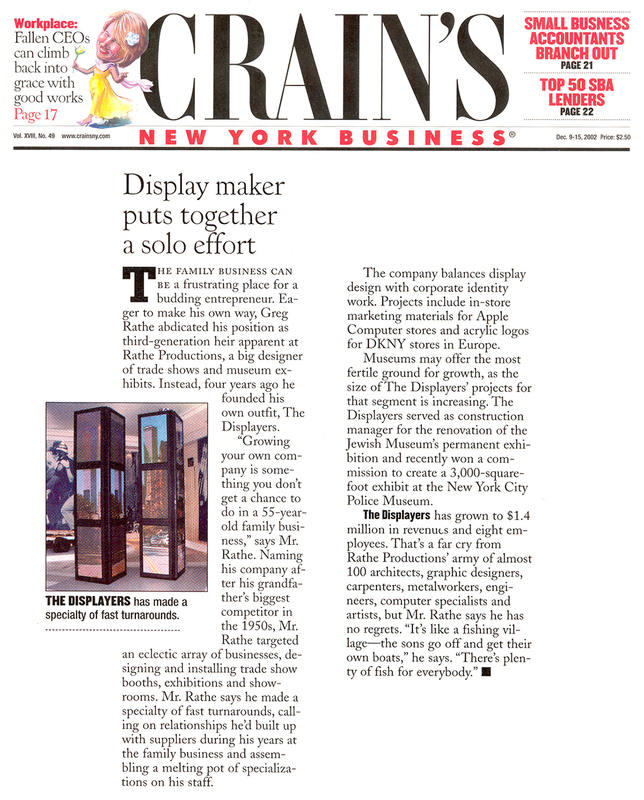 Museums may offer the most fertile ground for growth, as the size of The Displayers’ projects for that segment is increasing. The Displayers served as construction manager for the renovation of the Jewish Museum’s permanent exhibition and recently won a commission to create a 3,000-square foot exhibit at the New York City Police Museum.